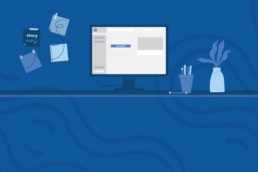 Keynote is an amazing presentation software with smart tools and mesmerizing effects that can help you create stunning and effective presentations. Below you will find the basics of this cool software. 1. 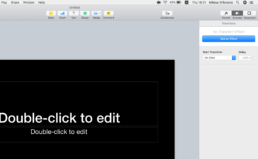 Before your first presentation, you are going to see a window in your Finder suggesting opening an existing presentation. The file extension for a Keynote presentation is .key. 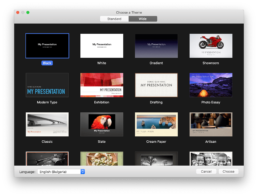 Your Keynote presentations are by default saved in the Keynote folder on your iCloud. However, you can change this folder and save them wherever you want. 2. Keynote can also open pptx and .ppt files. However, there are going to be some changes to the document, and we don’t recommend it. 3. If this is your first presentation, on the Left bottom corner you can find a “New Document” button. 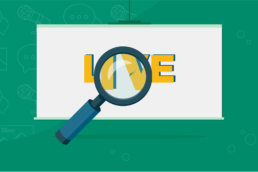 If you click on it a new window will open with suggested themes of a fresh new presentation. We would recommend using one of the first two themes (The black or white one). 4. 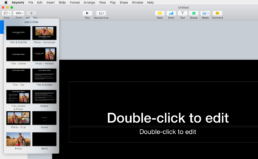 On top of the same window, you will see that you can choose a ratio of the slides Wide (16:9) or Standart (4:3). Use the Widescreen size for live presentations on projectors or big screens (including TV screens in conference rooms). Standard screen size is often used for documents sent over email for example or will be printed out. These sizes can be changed later, so don’t worry if you choose the wrong one. 2. A slide is a single screen of your presentation, and every presentation is composed of several slides. The slides are the home of your content and how it is going to be presented. 3. Animations are the effects and transitions of the slides. How the content moves on a slide is the effect added to the elements on the slide. 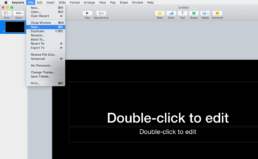 A transition controls the appearance of one slide as it transitions to the next one. 1. If you opened a new presentation, you will see the first slide automatically on your screen as a title slide. 2. If you want to add a new slide, you need to click on the Add slide button on the top left corner. 3. You can choose between different layouts of the content on the slide. 1. There are 4 main elements on a slide: Text, Media (Pictures or Video), Shapes and Data Vis (Tables and Charts). 3. If you want to add a new element you can click on one of the buttons in the middle of the top toolbar. 5. To edit the appearance of an element on the slide click the button Format on the right of the same top toolbar. Both, effects of the elements and transitions between slides, can be found on the right of the top toolbar under the button Animate. To add effect to an element, select the element and then the animation panel on the right will change. Build Out– An effect that controls, how the elements “go away” from the slide. To add an effect click Add an effect button and choose from the drop-down menu. To edit the transitions between slides you need to click away from the slide on the gray area. Then the Animation panel on the right is going to show the controls of the transitions. 1. Click on add an Effect and choose from the drop-down menu. 2. 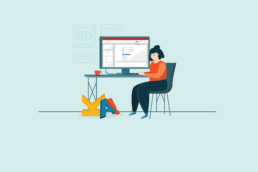 There are lots of cool animations to help you create an amazing presentation. We strongly suggest that you choose wisely your animations and add only movements that bring value to the appearance of your content. Click on the service menu on top of your screen File > Save. 1. Enter a name in the Save As field. Add tags if you want to. 2. To choose where to save the presentation, click the arrow next to the Where pop-up menu, then choose a location in the dialog. For example, it can be on the desktop. The default location Keynote chooses is the Keynote folder on your iCloud. This folder keeps your presentation across all of your iOS devices. 4. The presentation is going to be automatically saved as a Keynote file. See here more tips on saving options.